Jungle safari Nepal with Pink Mountain Treks and Expedition is the adventurous journey that gives chance to the adventure seekers to explore the unexplored trails and un-spoilt natural horizons of the forests of Nepal. In the jungle safari you can explore the national parks and wildlife sanctuaries as well as protective reserves. Along with the walking or hiking, you also have the option to explore the forest via a jeep or on an elephant or even on a horse drive to view wild animals in their natural habitat. Jungle safari is the best option to experience the nature’s wilderness and beauty. Nepal is a haven to more than 30 species of large animals, 180 species of mammals and more than 800 species of the birds. In Nepal you find the rare wild animals like rhinoceros, tiger, crocodile, snow leopard, red panda, Himalayan black bear, striped hyena, sambar, chital, sloth bear, langur etc and birds like Danfee, peafowl, red jungle fowl, kingfishers, flycatchers etc. Jungle safari in Nepal gives you the opportunity to explore the various types of rare wild animals and birds as well as the various types of the flora and fauna. Jungle safari in Nepal provides the excellent view of the rare wildlife. During the Jungle safari you also enjoy other activities like canoeing, nature walks, bird watching, excursions, and visit to an ethnic village etc. The best and famous places for the jungle safari in Nepal are Chitwan National park, Bardia national park, Koshi Tappu Wildlife Reserve Sukla phanta Wildlife reserve etc. Bardia national park is located in the plain land of western Nepal and covers the 968sq km. 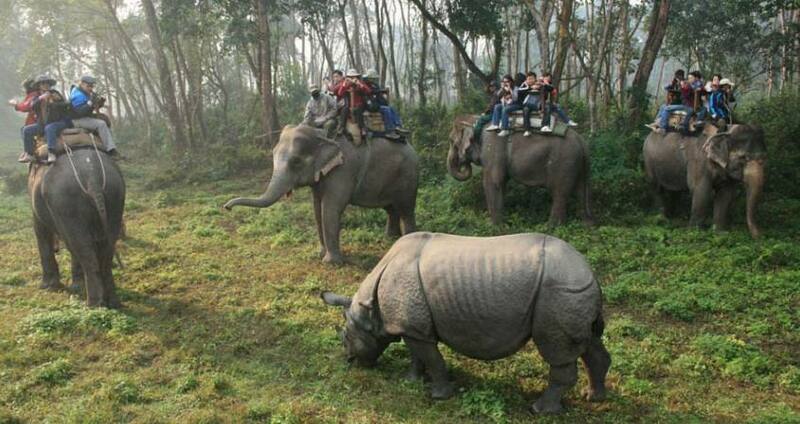 it is one of the popular destination for jungle safari in Nepal. Bardia national park is a haven to several endangered species of animals including tiger, wild elephant, rhinoceros, swamp deer, blackbuck, gharial crocodile, marsh mugger, crocodile etc. Koshi Tappu wild life reserve is located on the flood plain of the Santa Koshi River in the eastern Terai of Nepal. Koshi Tappu wildlife reserve is established in 1976 and covers 175sq km area mainly established to protect the rare wild water buffaloes. It is designated as a Ramsar site in 1987. Suklaphanta Wildlife Reserve is perfect destination for the jungle safari. It is located in the southern plain of the far western Nepal and covers the 305 sq km area. This reserve is the haven to the many rare wild animals like royal Bengal tigers, rhinos, crocodiles, wild elephants, swamp deer as well as many resident and migratory birds. Day 03:Jungle Safari in Koshi Tappu Wildlife Reserve. Day 04:Drive to Chitwan National Park. Day 05:Jungle Safari in Chitwan National Park. Day 06:Drive to Bardia National Park. Day 07:Jungle Safari in Bardia National Park. Day 08:Drive to Shuklaphanta Wildlife Reseve. Day 09:Jungle safari in Shuklaphanta Wildlife Reserve. Day 10:Drive to Surkhet and fly back to Kathmandu. Day 2Fly to Biratnagar and Drive to Koshi Tappu Wildlife reserve. Day 3Jungle Safari in Koshi Tappu Wildlife Reserve. Day 4Drive to Chitwan National Park. Day 5Jungle Safari in Chitwan National Park. Day 6Drive to Bardia National Park. Day 7Jungle Safari in Bardia National Park. Day 8Drive to Shuklaphanta Wildlife Reseve. Day 9Jungle safari in Shuklaphanta Wildlife Reserve. Day 10Drive to Surkhet and fly back to Kathmandu. Day 11Bhaktapur and Patan Tour After breakfast, proceed to sightseeing tour to heritage sites of Bhaktapur and Patan, the most medieval-look town in Kathmandu valley, and visit its Durbar Square.In the afternoon, free in Thamel, tourists favorite shopping area. Day 12Fly OutYou will be transfer to airport by representative of Pink Mountain Treks and Expedition for your flight to your destination before three hour of your flight schedule.